APRIL 10 is Spring 2 ACTion! Spring2ACTion is a 24-hour online giving event that offers grant money to the non-profits that raise the most dollars and engage the most donors. With a goal to raise $30,000 by midnight, WMPA will participate in Spring2ACTion on Wednesday April 10th, although you can start donating to WMPA as early as March 27. More information is here on our Spring2ACTion 2019 page. Click here to donate to WMPA for Spring2ACTion! ONE SINGLE DAY CAN HELP COMPOSE THE ENTIRE FUTURE OF WMPA. 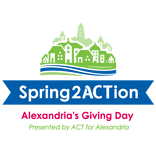 Spring2ACTion is a 24-hour city-wide online giving event, hosted by ACT for Alexandria, that offers grant money to the non-profits that raise the most dollars and engage the most donors. With a goal to raise $30,000 by midnight, WMPA will participate in Spring2ACTion on Wednesday April 10th. Why is Spring2ACTion so important to WMPA? Although WMPA is thrilled to accept donations any day of the year, Spring2ACTion is particularly important to us because it is a chance for us to get additional grant money from the city of Alexandria. How can WMPA get this additional grant money? If WMPA is the arts organization that has the most unique donors* or raises the most money on April 10, the city of Alexandria will give WMPA monetary prizes ranging from $100-$5000. *A unique donor is defined as a separate, individual donation. For example, even if there are four people in a household who are wanting to donate money to WMPA, each of those people need to individually donate money to WMPA using separate email accounts in order to be considered four donors. A donor making multiple donations from the same email address only counts as one donor (although the donation amount counts towards our goal to raise the most money). For unique donor consideration, the amount of the donation does not matter. Just the number of individual email accounts that donations came from. Is there any other way WMPA can win additional grant money? Yes!!!! In addition to being the OVERALL arts organization that raises the most money and has the most unique donors, WMPA can also get additional grant money during each of the four POWER HOURS. During each of these power hours, the city of Alexandria will give $500 prizes to the organizations that get the most unique donors or raise the most money during that hour. So donations during these power hours make us eligible for even more grant money! How can I donate to WMPA during Spring2ACTion on April 10? Every donation counts, large or small!!!! We mean it!! Every donor and every donation is important to us. How much money was donated to WMPA during Spring2ACTion in 2018? Thanks to the generosity of more than 240 donors, WMPA brought in over $25,000 online during Spring2ACTion 2018. In addition, because we have such amazing donors, we also won an additional $1000 in grant money from Alexandria. In addition, although they didn't count towards our "official" amounts with ACT of Alexandria, WMPA received offline cash and check donations for Spring2ACTion in 2018 in excess of $3,000. With this amount, and with the cash prizes we won, WMPA received more than $29,000 during Spring2ACTion 2018! On behalf of the WMPA Board of Directors, WMPA Executive Director, and WMPA Music Directors, we want to thank all of our generous donors for making it happen and for helping us keep the music playing. Do I have to wait until April 10 to donate to Spring2ACTion? No! Early giving through our Spring2ACTion page begins on March 27, and will count towards our total fundraising goal of $30,000. Eligibility for the prize grant money for most donors and most money raised, however, only applies to donations made on April 10. What do I do if I have questions about Spring2ACTion 2019? Many thanks to the more than 240 donors who donated over $25,000 online on April 25, 2018. WMPA also won $1000 in prizes, thanks to your generosity. You have made this year's campaign a great success. In addition, offline donations for Spring2ACTion received are over $3,000. With this amount, and the prizes we have won, WMPA will receive at least $29,000. On behalf of the WMPA Board of Directors, WMPA Executive Director, and WMPA Music Directors, we thank all of our generous donors for helping us keep the music playing.